Need to run your Millermatic 140 or 180? The Miller Blue Star 185 Welder/Generator with GFCI provides 6200 watts of continuous power (peak of 6500 watts). Perfect for the farmstead or general contractors, the Blue Star 185 packs a punch. 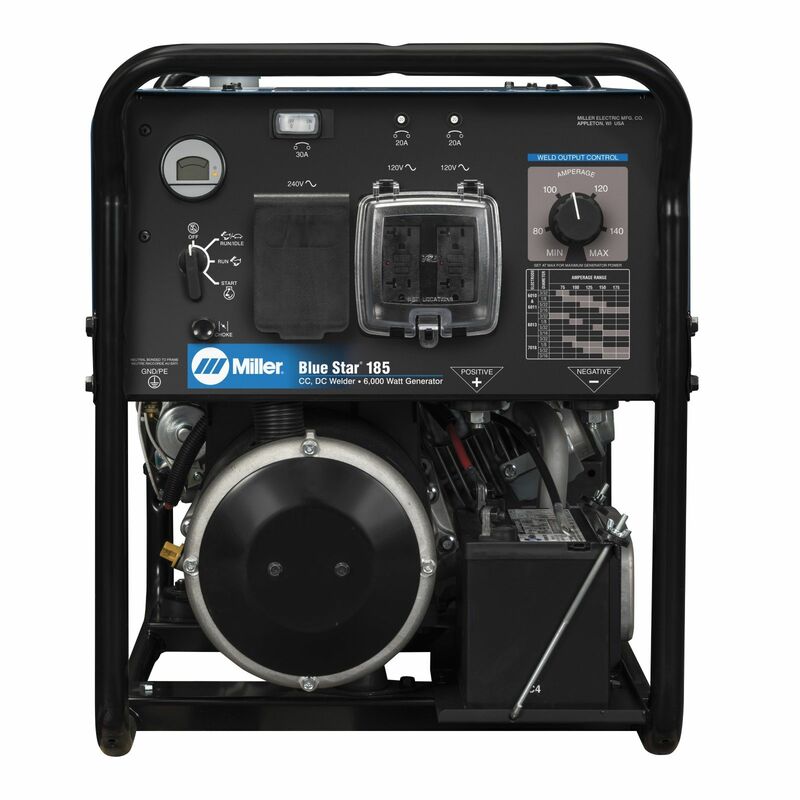 Miller provides the strongest and most reliable generator power. Their Accu-Rated, not inflated, standard for measuring generator power guarantees delivery of all the power the machine promises. Electric start, auto-idle, 6.25-gallon fuel capacity and engine hour meter. Weld and generator outputs exceed all other machines in this class. All of Miller's weld and generator outputs are rated at 104F (40C) to ensure maximum performance throughout the work day. • 6.25 Gallon fuel capacity, auto idle and engine hour meter. 5 stars - "Top notch customer service!! Will" Karen K. Top notch customer service!! Will definitely order again! 5 stars - "Buy It." John About to buy my second Blue Star.The first one is 28 years old and still going strong. Choke it, pull it one time, weld. 5 stars - "Miller Blue Star 185" Don D. smooth welder. Generator works great. Excellent value for the price. 5 stars - "Great machine" Guest This smaller unit handles most of our welding needs. It runs very smooth and quiet. It has become my favorite welder-generator. 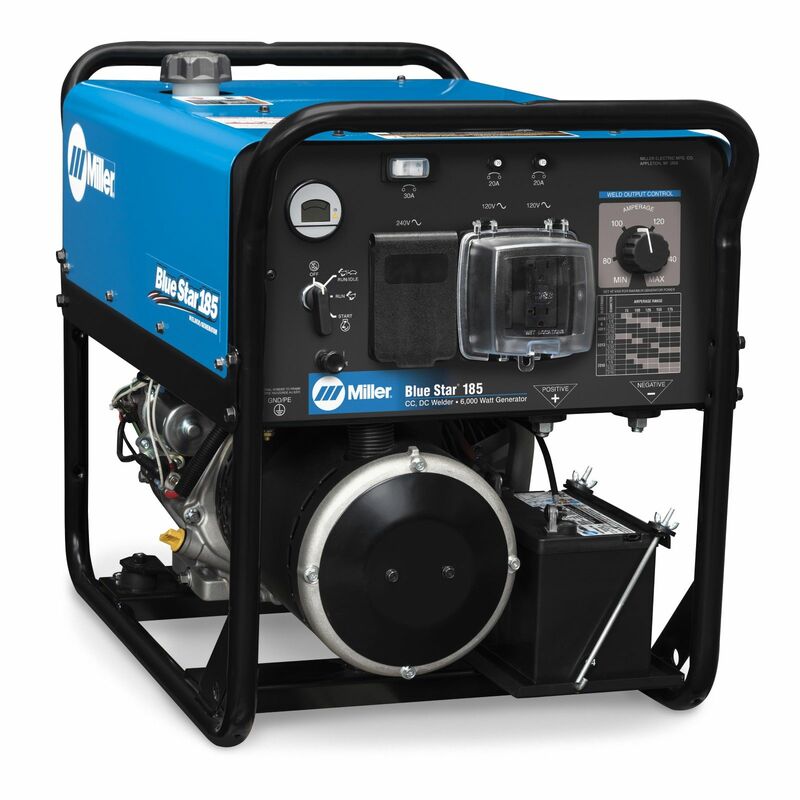 4 stars - "Miller is one of the smothes running machines" Stephen B. I love Miller welders, I've had a few and no longer even look at other machines, thank you for a great product. 5 stars - "Miller 185" Esaul R. This is the best welder I have owned . It is easy to use . 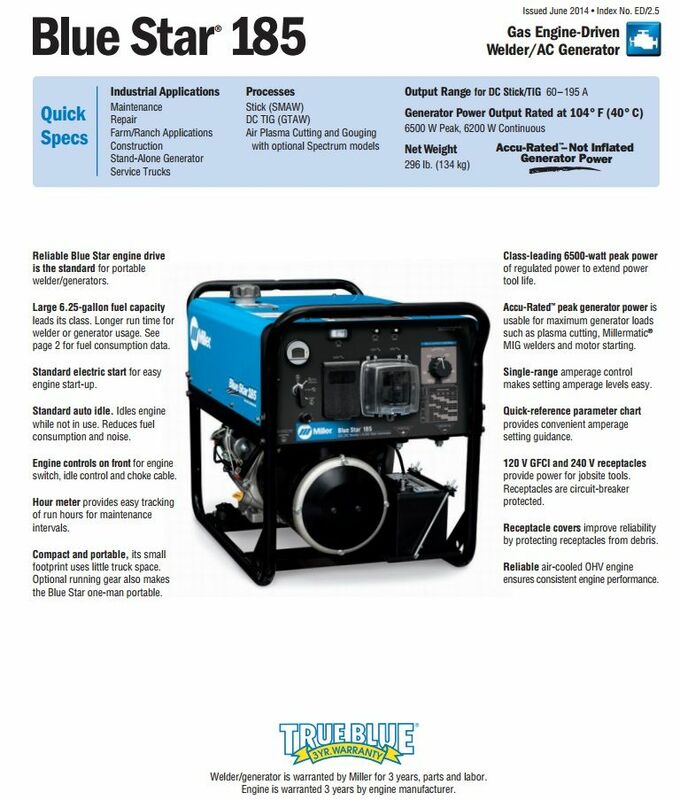 The power is great very ideal for work around the job site farm fixing machinery etc.